It was looking like News Corp was getting off its quarter-long roller coaster ride yesterday with a go-ahead vote to buy Dow Jones but elsewhere in media stocks, particularly entertainment, a different roller coaster ride kept going. After the close of market Tuesday, DreamWorks Animation and CBS both released quarterly earnings. It was a good day for animators, not such a good day for TV. DreamWorks Animation reported towering second quarter revenue with net income of $61.8m (60 cents a share) for the quarter ended June 30th. Even subtracting a one time gain of 11cents a share for a reduction in reserves for home video sales, and another one time gain of 4cents from tax accounting, it was huge return relative to last years income of 13.7m for the same period. Quarterly revenue in the film industry is highly variable and heavily influenced by the volume and quality of titles released at any given time. DreamWorks strategy is to release one franchise title and one new film every year. 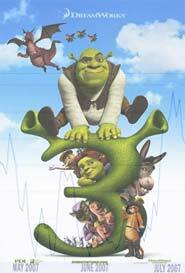 Shrek the Third was the franchise film for this year and it released this past quarter. They’ll be living off of it for the rest of the year. The Ogre and his friends proved a runaway hit. The film, and related merchandising, generated $109.1 in revenue for the second quarter. It had the biggest weekend opening of all time for an animated title. Since its release in May it has eared more than $400m globally. Though new title Bee Movie, which was written and voiced by Jerry Seinfeld, is on track for release in November, Shrek 3 will continue to be the main driver for company revenue for the rest of the year. The international box office results will be a major contributor for the third quarter. DVD sales are timed to hit the books for the fourth. At CBS, there was far less to smile about for the quarter (also ended June 30th). The company reported net income of $404m (55 cents a share), down almost fifty percent from the same period last year when they reported $781.7m ($1.02/share). Adjusted for tax benefits and the effects of station divestitures, the return wasn’t as dramatic as it looks. Adjusted earnings per share were in at 56cents per share, down from last year but ahead of analyst averages of 51cents. In gross revenue, however, the company missed their numbers. Analysts expected revenue of $3.42b, the company reported $3.37b, down 3.1% relative to the same period last year. A number of factors contributed to the shortfall. Among explanations was the discontinuation of the UPN Network, divestitures and the earlier timing of this past years NCAA tournament. 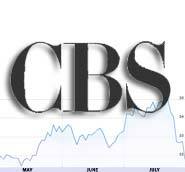 Looking forward, CBS is projecting single digit growth for revenues and high single digit growth for earnings per share.